Vladimir Putin travelled to Germany to meet Chancellor Angela Merkel for talks about Syria, Ukraine and energy matters later on Saturday. 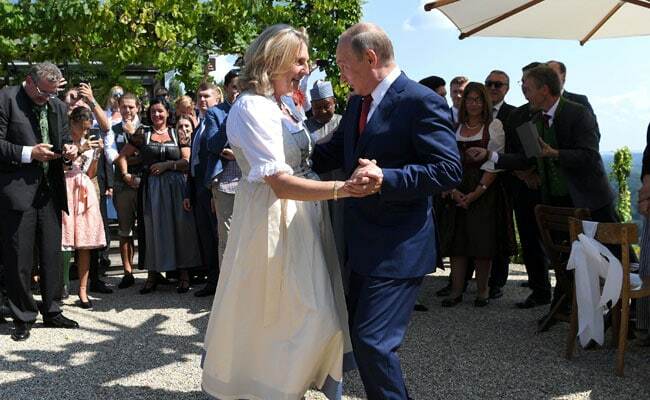 President Vladimir Putin dances with Austria's foreign minister Karin Kneissl at her wedding. Mr Putin arrived in a car carrying a bouquet of flowers and accompanied, local media said, by a troupe of Cossack singers booked to serenade the newlyweds. He was on a stopover on his way to meet German Chancellor Angela Merkel outside Berlin. Photographs showed Kneissl, 53, smiling in a long white and cream "dirndl" dress and talking to Putin as they danced in a vineyard in southern Styria province, the venue of her wedding to entrepreneur Wolfgang Meilinger. Mr Putin - who made a toast in German at the wedding, according to the Kremlin - was pictured listening to her intently. There have been no reports that Kneissl - a polyglot Middle East expert without political affiliation - has a particularly close friendship with Putin. But she was appointed to her job by the far-right Freedom Party (FPO) which has a cooperation agreement with Putin's United Russia party. Chancellor Sebastian Kurz and his conservatives, who control Austria's EU policy, have said Austria will toe the EU line - though they have also pointed to Austria's history of neutrality and its relatively warm relations with Russia. Kurz also attended the wedding. Joerg Leichtfried from the opposition Social Democrats tweeted that Austria's current presidency of the Council of the European Union put it in an especially delicate spot given tensions between Putin and the West. "All the more symbolic and harmful to court the Russian president in this manner," he said. Mr Putin travelled to Germany later on Saturday to meet Chancellor Angela Merkel for talks about Syria, Ukraine, and energy matters. Mr Putin visited Austria in June on his first trip to the West after being re-elected as president.